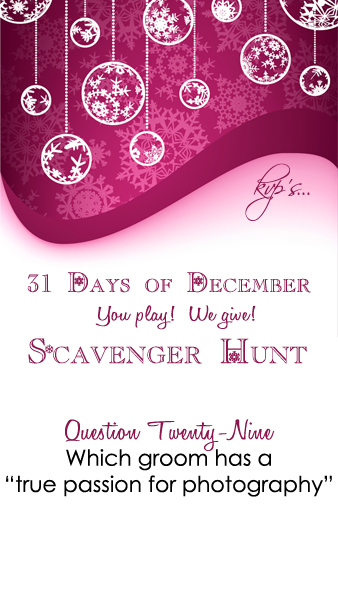 It’s Day Twenty-Nine of the 31 Days of December Contest! 1. Once you find the answer to the question below, please post it in the “Comment” section of the blog post in which is was found. 2. If the question is answered on any other blog post, it will not count. 3. PLEASE list your first and last name when filling out your name in the “Comment” section. 4. Questions answered after midnight on the day of the post will not be counted. 5. New teams can be formed and started at any point, however please note that previous scavenger day questions cannot be answered. 6. In an effort to remain fair, we will only be allowing two comments per ip address, per day. Go Teams! Get your friends and family answering on your behalf. The more correct answers, the greater your chances of winning! !